Production: Haxan Films; distributed by Artisan Entertainment (U.S.A.), Shochiku Films (Japan), Budapest Film (Hungary), Mars Films (France), Eurocine (Argentina), Arthaus Filmverleih (Germany); 16 mm black-and-white and High 8 color video; running time: 80 minutes (U.S.A.), 81 minutes (Japan), 83 minutes (Argentina); sound mix: Dolby Digital. Released July 1999 (limited). Filmed in Seneca Creek State Park, Wheaton, and Rockville, Maryland; shot in 8 days; cost: $22,000. Producers: Robin Cowie, Bob Eick (executive), Kevin Foxe (executive), Gregg Hale, Michael Monello (co-producer); writing credits: Daniel Myrick, Eduardo Sánchez; cinematography: Neal Fredericks; editors: Daniel Myrick, Eduardo Sánchez; sound: Dana Meeks; art director: Ricardo Moreno; production designer: Ben Rock; original music: Tony Cora; sound effects editor: Elisabeth Flaum; foley mixer: Shawn Kennelly. Cast: Heather Donahue ( Heather Donahue ); Michael C. Williams ( Michael Williams ); Joshua Leonard ( Josh Leonard ); Bob Griffin ( Interviewee ); Jim King ( Interviewee ); Sandra Sánchez ( Woman with Baby—Interviewee ); Ed Swanson ( Interviewee ); Patricia Decou ( Interviewee ); Mark Mason ( Interviewee in yellow hat ). Awards: Csapnivalo Golden Slate Awards for Best Horror Movie and Best Movie, 2000; Florida Film Critics Circle Golden Orange Award "for furthering the cause of Florida filmmakers and independent filmmaking" (Robin Cowie, Gregg Hale, Michael Monello, Daniel Myrick, Eduardo Sánchez), 2000. Stern, David A., The Blair Witch Project: A Dossier , New York, 1999. Pelucir, Talis, The Unofficial Blair Witch Project Internet Guide , Port Orchard, Washington, 2000. Nashawaty, Chris, "Independents' Day," in Entertainment Weekly , vol. 1, no. 476, 12 March 1999. Ebert, Roger, " The Blair Witch Project ," in The Chicago Sun-Times , http://www.suntimes.com/ebert/ebert_reviews/1999/07/071603.html . Morris, Wesley, "Pitching Tent in Audience Psyche," in The San Francisco Examiner , 16 July 1999. Ascher-Walsh, Rebecca, "Rhymes with Rich," in Entertainment Weekly (New York), vol. 1, no. 496, 30 July 1999. Travers, Peter, "The Blair Witch Project," in Rolling Stone (New York), no. 818, 5 August 1999. Corliss, Richard, "Blair Witch Craft," in Time (New York), 16 August 1999. Farber, Stephen, "Mock Inspiration," in Movieline (Escondido, California), vol. 10, no. 11, August 1999. Guthman, Edward, "Terror Comes Alive in 'Witch': Pseudo-documentary Has Visceral Power," in The San Francisco Chronicle , 22 October 1999. Burr, Ty, "Video: Forest Dangers (B+)," in Entertainment Weekly , vol. 1, no. 509, 29 October 1999. Schwarzbaum, Lisa, "Terrorvision," in Entertainment Weekly , vol. 1, no. 495, 23 July 1999. "In October of 1994, three student filmmakers disappeared in the woods near Burkittsville, Maryland, while shooting a documentary. . . . A year later their footage was found." Thus begins The Blair Witch Project , Daniel Myrick and Eduardo Sánchez's shoestring-budgeted horror "mockumentary," which parlayed an innovative marketing campaign and incredible word-of-mouth into more than $140 million in the United States alone—making it one of the most profitable independent films of all time. Led by aspiring director Heather Donahue (the characters have the same names as the actors who play them), the three "student filmmakers" mentioned above make their way to Burkittsville (formerly Blair), Maryland, in order to shoot footage for a documentary they are making about a local legend, the so-called "Blair Witch." Word has it that this mysterious figure has been haunting the nearby Black Hills Forest since the late 18th century, and is responsible for a number of heinous murders. After conducting interviews with some of the locals, the trio hike into the forest so as to gather additional footage. While Michael handles the sound recording, and Josh shoots in 16 mm black-and-white, Heather captures much of the action on High 8 color video. None of them experienced campers, they soon get lost, and their once-cheery demeanor deteriorates into an increasingly volatile mixture of fear, blame, frustration, and panic. To make matters worse, ominous signs begin appearing with disturbing regularity: carefully arranged piles of stones positioned outside their tent in the morning; strange and disturbing sounds at night, of whispered voices and babies crying; wooden effigies hanging in the trees. Then Josh disappears, the only clue a piece of his shirt with what looks like a piece of flesh wrapped inside it, discovered by Heather the next day. In the film's harrowing finale, Michael and Heather stumble across an apparently abandoned house. Hoping to find Jeff, they enter; what they discover is a nightmare. Through the lens of her camcorder, we see what Heather sees. And what we see is nothing much, just darkness and ruins and children's handprints on the walls, and finally, after someone or something knocks her out (Michael has already been attacked), a blank ceiling, which lasts until the tape—and the film itself—reaches an end. The Blair Witch Project is a unique and important production insofar as it looks forward, to the future of film promotion, at the same time as it looks backward, to a time when horror movies did not rely on special effects or the concoction of gory spectacles to instill a sense of terror in audiences. Instead of the usual trailers and print ads, Myrick and Sánchez (first-time directors who met while attending the University of Central Florida) concocted an elaborate backstory— what they dubbed a "mythology"—for Blair Witch , which they posted on the film's official website ( http://www.blairwitch.com ). The website presents the events of the film as real occurrences, and includes character bios, news clips about the disappearances, interviews with relatives, information about the police investigation (supposedly declared "inactive and unsolved" in 1997), excerpts from Heather's journal, and a detailed history of the Blair Witch legend. In addition, and just prior to its screening at the Cannes Film Festival in May 1999, "MISSING" flyers with descriptions of Heather, Michael, and Josh were put up all around town. What all of this amounts to is a symbiotic relationship between film and extratextual discourse, one in which the documentary pretensions of the former are strongly enhanced by the non-fictional cues of the latter. Of course there were various ways for people to discern that the entire story was a hoax, but a great many were simply not interested in seeing through (or all the way through) the deception. The film generated so much hype after its premiere at Sundance in January 1999 that an additional screening had to be scheduled in the 1300-seat Eccles theatre, which was filled to capacity. Soon afterwards, Artisan Entertainment picked up The Blair Witch Project for distribution in the United States. 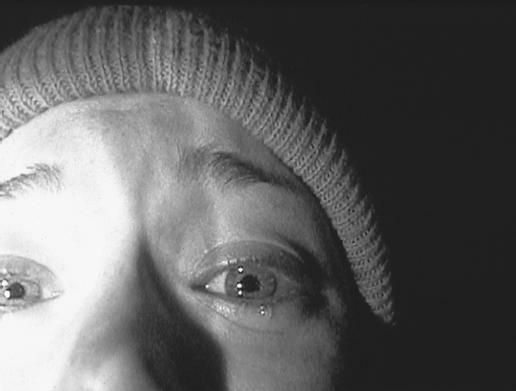 Despite criticisms directed towards the film's sometimes slow pacing and non-stop, nausea-inducing handheld camerawork, it is hard to deny that The Blair Witch Project succeeds in its employment of cinema verité as a means of instilling terror in viewers. Myrick and Sánchez's unique production method has itself become the stuff of legend: not only were the actors responsible for shooting the entire film themselves (over the course of eight consecutive days and nights); they had to carry their own equipment, and improvised almost all of their lines. Three or four times a day, the directors would write notes to each cast member, sealing them in tubes for their eyes only. Explained Myrick, "We were trying to create an environment for these actors and have this improv come to life and be as realistic as possible. That's what we think really contributed to the unseen fear that's been so very effective." By achieving such a high degree of realism, the directors took their product a step beyond earlier horror films with mockumentary aspirations, films such as Wes Craven's The Last House on the Left (1972), Tobe Hooper's The Texas Chainsaw Massacre (1974), and Michael and Roberta Finlay's notorious Snuff (1976). By exploiting some of our most basic, inescapable fears—of the dark, of the unknown, of sounds whose source cannot be detected— Myrick and Sánchez and the film's three leads manage to elicit intense emotional responses from viewers. Some of the most terrifying moments occur when neither of the cameras are functioning, and all we are able to see is a black/blank screen (this is reminiscent of a famous scene in Robert Wise's 1963 classic, The Haunting ). Which proves once again that what our imagination conjures up when effectively prompted is far worse than anything even the most sophisticated special effects or makeup can produce. It is to their credit that those involved in the making of The Blair Witch Project were well aware of this oft-forgotten fact.